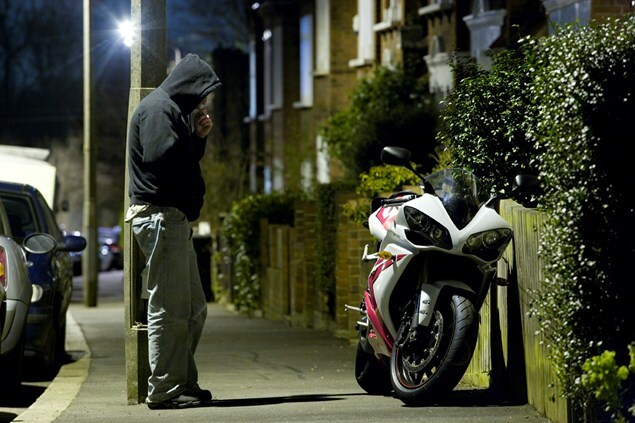 Levels of motorcycle and moped theft are higher than we’ve ever seen before. The rise in this type of crime has been most noticable in London, the South East and Bristol, but is a growing problem in all areas of the UK. No doubt you’ve seen the videos plastered all over social media and newspaper websites – thugs on mopeds armed with bolt croppers and battery powered angle grinders brazenly stealing someone’s pride and joy in broad daylight, safe in the knowledge that there’s next to no chance they’ll ever be caught. It’s disgusting, and just like you, we’re sick of it. Bike security isn’t the most exciting subject but neither is waiting on hold for your crime number after discovering your wheels have gone walkies. Unbelievably, 60% of us use no form of security at all apart from the steering lock… and with crooks all too aware that stolen bikes equal easy money it’s clear that the problem isn’t going away any time soon. While we’ll all acknowledge that if a thief wants your bike they’ll definitely get it, there are some things you can do to deter them. After all, opportunist theives will always choose the easiest bike to steal, so you’d be mad not to invest in at least some security. There’s loads of tatty security products on the market that hide behind all sorts of false claims and schemes, so this guide aims to cut the crap and you what to buy and how to use it properly. Having CCTV, alarms and a tracker is all well and good, but nothing can deter thieves like a good old fashioned lock and chain and they don’t come much tougher than the series IV from Almax. 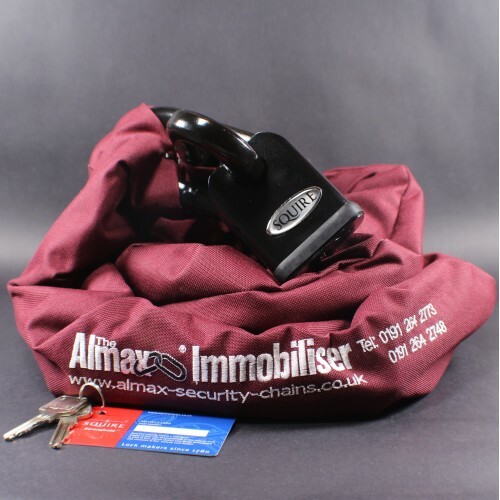 Ranging from 1 to 2.5 metres in length, Almax say the series IV Uber is ‘the world’s toughest security chain’. It’s constructed from carbon manganese alloy steel enhanced with boron and is case hardened. The chain itself and the accompanying Squire SS65CS padlock are both Thatcham approved and though you may find cheaper chains, they won’t come much tougher than this, and will put up a fight for a decently long time against a grinder… and literally cannot be bolt cropped. Use more than one chain if necessary! Avoid Oxford chains and locks. They are about as much use as a chocolate fire-guard and will not protect your bike in the slightest. Traditional ground anchors have a few drawbacks associated with them, the main one being the difficulty in keeping the chain away from the floor where it’s at its most vulnerable to attack. 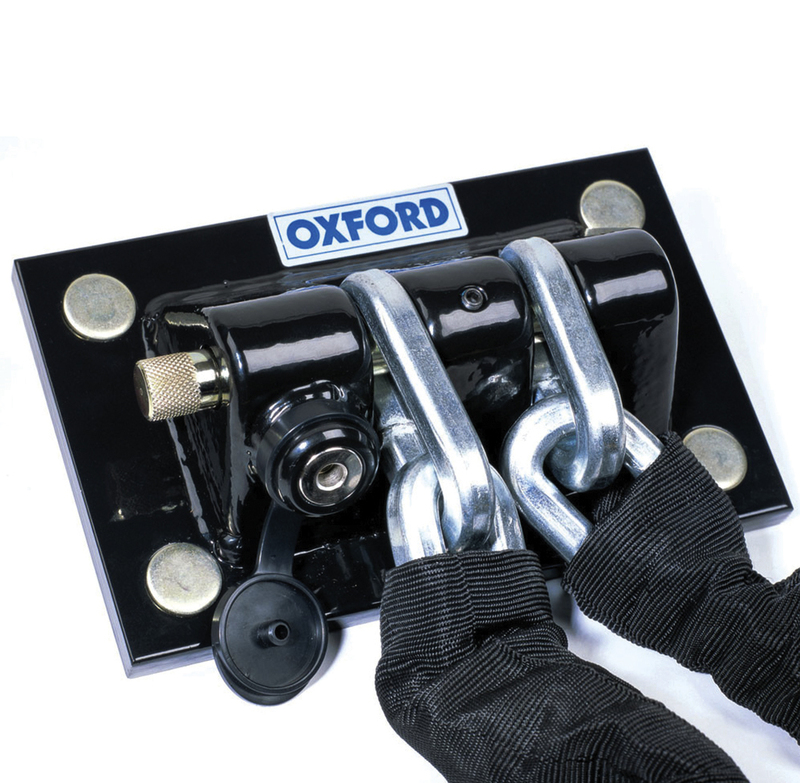 The Oxford Docking Station is designed to be either wall mounted or fixed to the ground in the traditional manner and weighing in at 4.5 kilos of forged hardened steel, it’s a substantial alternative to your regular ground anchor. If you can’t use one of these – for example if you park in a shared underground car park – try to lock your bike to a pillar, or some other immovable object. With chains like the Almax we featured above, you can link them together to form one big chain (you’ll need one extra lock per chain that you’re joining together). If the ne’er-do-wells do manage to hot foot it away with your pride and joy you’ll be pleased to know it isn’t necessarily all over. The Bike Trac from Road Angel is a 66mm x 33mm x 15mm box of tricks that might just be your savior, but don’t take our word for it. The GPS, GPRS, GSM and RF tracking device has its own 30 day in-built battery supply and proved its worth last month when a Londoner had his 899 Panigale pinched. Thankfully it was fitted with Bike Trac and using the system and Interpol it was successfully found over 1,000 miles away in Lithuania. 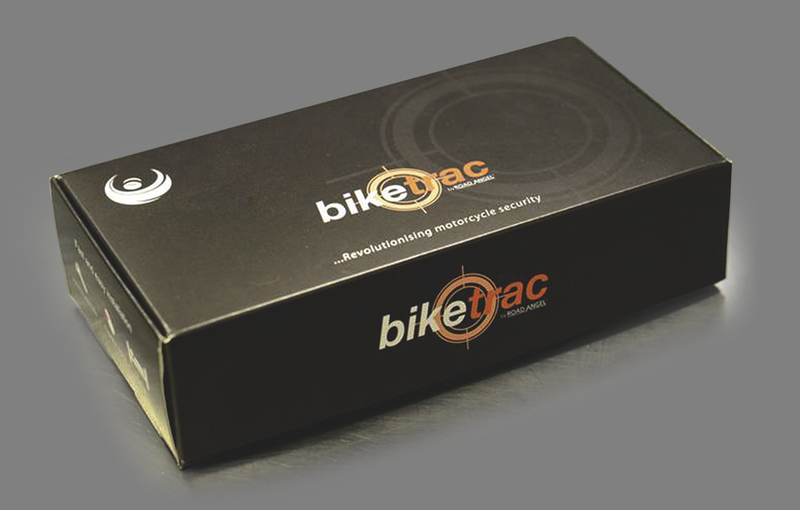 It’s a properly clever bit of kit and will also inform you by text message if your bike has been moved or even crashed. For ultimate peace of mind there’s nothing that can top it and nearly half a million pounds worth of bikes were recovered in 2013 using the device. We’d love to show you what the device actually looks like but we can’t so make do with a photo of the box instead. It may seem obvious to you, but given how many bikes we see left un-covered on the road, apparently it isn’t obvious to all of us. Hiding your bike with a cover is one of the best and cheapest weapons available. Don’t get a bright red Ducati or green Kawasaki branded one, get something subtle – black, and with as little branding as possible. We’d recommend Oxford’s Stormex cover as the cover of choice. It won’t attract attention and there’s loops in the cover front and back for chains to pass through. Did we mention it’s heat proofed against hot exhausts and engine casings meaning you can throw it on straight away? Wandering eyes wouldn’t have looked if this was covered up. Like chains and locks, no disc lock is foolproof, but security is about layering. More layers means more time, and the more time it takes to steal your bike, the more likely a thief will decide it isn’t worth the bother. There are plenty of disc locks on the market, but here’s the tip: don’t buy a rubbish one. Cheap disc locks are often made of cheap, soft metals like zinc. The more expensive ones will actually put up a fight and add meaningful amounts of time to the total time required to take your bike. 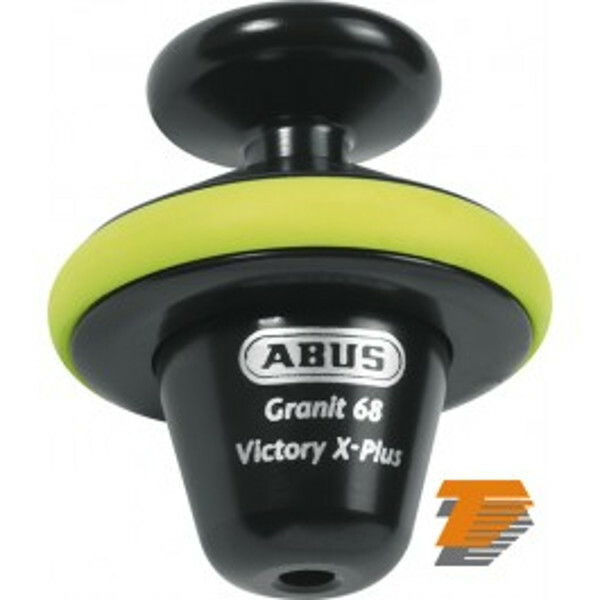 You should be looking to spend a minimum of £70 per disc lock, and we recommend the Abus Victory 68 which comes in at around £100 online. We promise this isn’t a bedroom toy. If you only have one disc lock, lock the rear disc up. Alarmed disc locks can be a nuisance in windy weather. For those of you without garages there is an answer in the form of the ‘Racer’ from secure-a-bike. The price may seem a little steep but bear in mind when the nuclear apocalypse arrives, you can wheel the bike outside and use it as a makeshift bunker, it’s that tough. The setup you see here is pretty discreet and looks more like a toolshed so won’t attract too much attention in the first place. Even if the thieves arrive determined and armed to the teeth it’ll put up some considerable resistance thanks to Thatcham approved 6-lever 4-pin CISA locks. The ‘racer’ works on a trolley system which clamps the front wheel in place and the bike simply slides in and out with ease. If you want storage that offers garage levels of security without bricks and mortar then the secure-a-bike ‘Racer’ is a top level alternative. 7. 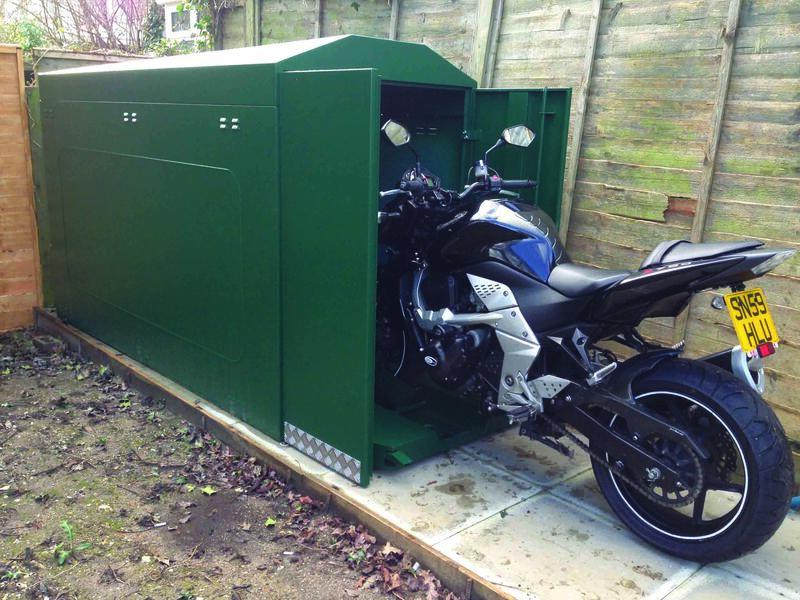 Storing your bike in a garage, garden or shed? Get a baby monitor. Thieves are stupid and lazy. Outsmarting them isn’t hard. If you’re parking your bike in a quiet underground car park for long periods of time – say over winter – do something to make look unridable. Take the seat and battery out – it’ll give the impression that the bike isn’t in working order and will be a waste of time to steal. You might think this sounds daft, but I’m as sure as I can be that this exact tactic saved my Triumph Street Triple R a few years back. If you don’t use them, remove the pillion pegs. Thieves often push stolen bikes using an accomplice on another moped. The stolen bike is pushed by the rider of the moped using the pillion pegs. No pegs? Much harder to push away. It’s the small things, but everything adds up in this game. Don’t leave locks chained to pillars, railings, etc while you’re out riding (or at work, or whatever). If a thief spots an Almax chain left chained around a pillar, it’s a dead give-away that something, at some point, will be returning there. This gives the thief the opportunity to steal your lock or disable it in some way – meaning when you come home, you can’t lock your bike up, which makes the job of the thief easier when they come back for your bike. Sometimes what looks like petty theft is a sign that someone is after your bike. Have you ever randomly had a brake lever stolen? It might be an effort to disable your bike – i.e., to make you leave it parked in place while you source a replacement brake lever. If this happens, move your bike somewhere safe (a mate’s garage, perhaps) immediately, and up your security game in the mean time. Yes, your bike is your pride and joy, but it’s just a lump of metal when all’s said and done. Unfortunately, there’s been a number of cases, mostly in London, where thieves have threatened and ultimately attacked owners who have caught them in the act. As much as it pains us to say it: don’t be a hero. If you discover a bunch of thugs attacking your bike – let them. You risk being stabbed, having acid thrown in your face, or worse if you try to intervene. Dial 999 – however pathetic that may sound – and let the Police deal with it. It’s not worth your livelihood, and karma will eventually catch up with the perps. Film the crime if you can – every shred of evidence helps – and despite the Police’s hands largely being tied at the moment by our namby-pamby government, they are slowly being allowed to do more to hunt down the scrotes who make our lives a misery.